Andrew Calvin - law, information technology and rants: Google Keep? 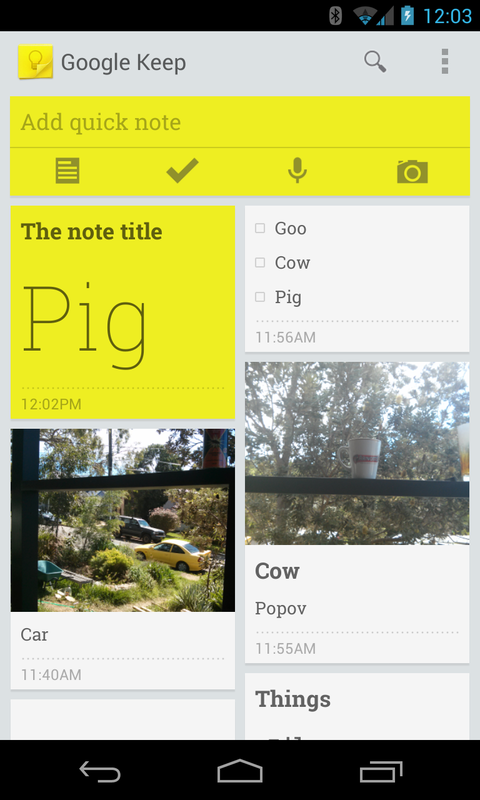 Google has released a new application named "Google Keep", available on Google Play for Android, and it's also a web app. It has a few similarities to Google Notebook, which I used many years ago until Google shut it down. It now lies in the Google Graveyard. The shutting down of Notebook led me to explore and ultimately adopt Evernote, which I now pay for - it's worth it, despite the iOS versions being quite unstable. 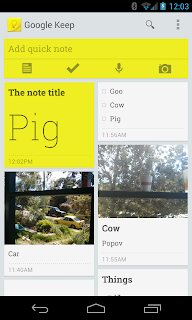 So should you use Google Keep? I'm quite burned at the moment because Google is shutting down Google Reader, which I use several times a day and rely on it for my research for my columns in the Journal of the Law Society of New South Wales and other writing. When Google Reader is shut down I will have lost two Google services that I relied heavily upon. Sure, I didn't pay to use them, but Google monetised them and encouraged me to use them. At least the Google data liberation team does a good job in ensuring you can liberate your data. Not in my wildest dreams would I use Google Keep. It has a small fraction of the features of Evernote, and really offers nothing new. If Google neglects it as much as it has Tasks in Gmail then Phil Libin will not be losing sleep over it. I don't think Google needs to do Keep - and I don't think it's been thought through properly There is a level of integration with Google Drive, which makes sense, because the old paradigm of storing different types of data in different places is pretty immature. If all I care about is the data then it doesn't matter if that data is an email, spreadsheet, presentation or postal letter. However, I don't see this level of thinking coming through with Keep. And finally, I'm not going to put all my data in one basket. I'm a happy Google Apps for Business user, but my reliance on a single vendor is going to stop there. Of course Google isn't going to go broke or go away suddenly, but us lawyers are usually a cautious lot.